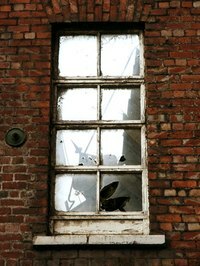 A putty-looking substance called glazing holds the glass in place in older, paned windows. Over time, this material cracks and crumbles. The resulting cold air and moisture that comes into the home increases energy bills and leads to water damage of walls and floors. Replacing the glazing requires taking care to avoid breaking the glass. This is an ideal spring or fall project to help weatherize and insulate your home. Plan on the repair taking 15 to 20 minutes per glass, per pane. Remove any broken glass by placing a rag over the glass and pressing against it. Pull all glass shards free and toss them in an appropriate waste receptacle. Use a putty knife to pry at the cracked glazing. Most should pull free using a gloved hand. Use a heat gun on the remainder to soften the glaze. Keep the heat gun in motion so as not to cause the glass to break from the heat. Set the pieces of glass aside. Add a coat of primer to areas of bare wood exposed after removing the old glaze and glass. Place a bead of acrylic latex caulk along the bottom center of each section of the pane. Set the glass down into the caulk and position it in an upright position. Cut open the DAP glazing and load it into a caulking gun. Run a bead of glazing along all inside and outside borders of the glass. This will seal the glass into the pane. Smooth the surface of the glaze with your fingers. Allow the glazing a few days to dry without touching it. Use a small paintbrush to apply a coat of primer and finish latex paint. The paint will completely cure within a few days. Replace any and all broken glass during the course of this project. Many lumberyards and hardware centers can cut for the glass dimensions you need. Reader's Digest's Family Handyman states, "Replace broken glass while you're at it. This adds only a few minutes and a few dollars to the job." Don't remove the window unit if you are unfamiliar with the specific removal and installation requirements. This project can be done with the window in place. Wear safety glasses when removing the old glazing to avoid getting particles in your eyes. Wear gloves to protect hands from broken glass.